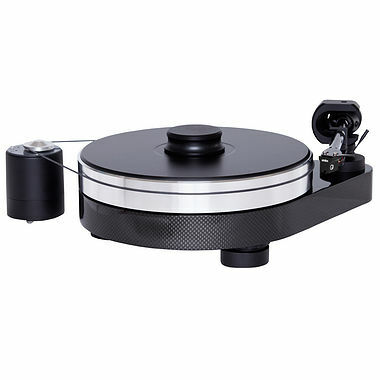 Project RPM 9 Carbon Turntable with cartridge option. Available with Online Finance and Free Delivery. After an extensive period of research, development and testing the RPM9 Carbon from Pro-Ject Audio Systems is now here! It features an extra heavy mass loaded chassis which is decoupled from its surface using magnetic feet. The polished 7.2kg acoustically inert aluminium platter has TPE damping, a vinyl top and inverted ceramic main bearing delivering absolutely stable speeds along with extra low rumble. Please note: You can add the flagship Ortofon Quintet Black Moving Coil cartridge to this purchase at a very special rate (saving £250).